WB No. 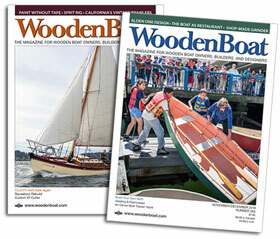 239: Sketchbook is a department introduced in the July/August issue of WoodenBoat. The idea behind it is simple: Readers send us their requirements for a new and unique boat. If their letter is chosen, our Sketchbook designers, Laurie McGowan and Michael Schacht, will develop the design and present it on the pages of WoodenBoat, and on this web site —Eds. For our inaugural installment, Devid Gelinas of Penobscot, Maine, wrote us seeking a powerboat “that can accommodate up to 10 adult-sized passengers for day outings on Maine’s Penobscot Bay.” David continues: “I want to explore islands, but not be constrained by the need to carry a dinghy to shuttle passengers ashore. Afternoons on the bay can have 20-knot breezes and 3–4′ seas. I won’t be driving hard in those conditions, but I want the boat to be safe and comfortable and still make a decent turn of speed. David goes on to list a specific set of requirements, and the designers responded with the light and lovely Seahawk, a rendering of which we see here. Below is a rotating three-dimensional model of the boat. 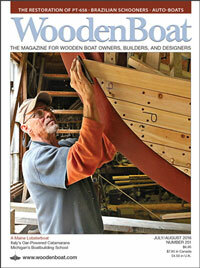 To read and view the full description of the design, pick up a copy of the July/August issue of WoodenBoat.